The UK government has pledged £12m to help France tackle the problem of illegal immigrants trying to enter Britain through Calais. A plan announced by Home Secretary Theresa May and French counterpart Bernard Cazeneuve will see the two countries work more closely. Security will be bolstered at the port, which has seen increasing numbers of migrants gathering in recent months. New technology may be introduced to detect migrants hiding in lorries. Other measures include building more robust fences as well as increasing security in the car park area of the French port. Immigration Minister James Brokenshire said British and French law enforcement agencies would also target organised crime gangs behind people trafficking and smuggling. 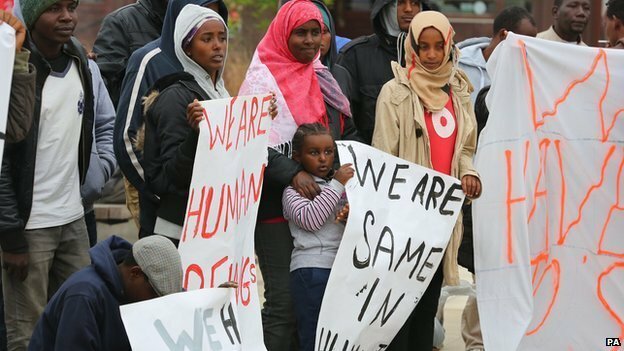 Tensions have grown in Calais in recent months as the number of people gathering there has risen. France believes there are 1,500 illegal immigrants in Calais, the numbers having increased by 50% in the past year as people flee from humanitarian crises in northern and eastern Africa and the Middle East. Many are camping or living in squats and there have been clashes on the streets of the town. The UK is to contribute five million euro (£4m) a year for three years to a joint intervention fund. In a statement, Mrs May and Mr Cazeneuve, France’s minister of the interior, said they would “ensure that all measures taken will deter illegal migrants from congregating in and around Calais”. They promised to “respond to health emergencies and protect vulnerable people”, including people trafficking victims, but insisted the measures would not encourage migrants to gather at the port. The ministers said their efforts will aim to identify measures to ensure migrants do not breach the laws of either country or threaten the safety of Calais residents or those using the port. Mrs May and Mr Cazeneuve have also pledged to push for European Union action on what they described as an “evident migration crisis” in the Mediterranean Sea. As part of the agreement, the layout of the port will be changed to make it easier to carry out controls and improve traffic flow. The money will also fund information campaigns to explain the consequences of illegal immigration to the UK and provide details on asylum in France or assisted voluntary return. The National Crime Agency is to second a full-time officer to Ocriest, the French agency responsible for tackling illegal immigration, and the French border police will send two officers each month to work with the joint border intelligence unit in Folkestone. The BBC’s Hugh Schofield in Paris said France saw it as a “landmark deal” because, in its view, Britain has now recognised it has a “responsibility” in securing the port. Authorities in Calais have been “vocal” in asking for help over the summer, leading to the involvement of the French and now the British government. However, he added that no one believed the new scheme would solve the “chronic” problem at Calais, which goes back more than a decade. Mayor of Calais Natacha Bouchart had threaten to blockade the port unless the UK helped to control the problem. Earlier this month, scores of migrants got past security and tried to run up the ramp of a ferry headed for the UK, but their attempts were foiled. Posted on 20th September 2014 by newsafrica. This entry was posted in Africa, Democracy, France, Human Rights Violations, United Kingdom and tagged Bernard Cazeneuve, Britain, Calais, Folkestone, France, James Brokenshire, National Crime Agency, United Kingdom. Bookmark the permalink.